Arroz con Gandules | I am in full on Christmas mode! Feliz Navidad mi gente! I just so excited to be going home to P.R. for Christmas. Because I am so pumped for Christmas I’m going to be sharing some of my favorite Christmas foods. Yesterday I told you all about a creamy coconut rice pudding called arroz con dulce. Today we are going to talk about rice. Rice? Yes, rice because you must understand that Puerto Rican Christmas isn’t Christmas without arroz con gandules. Every Puerto Rican Christmas Eve dinner requires three things arroz con gandules, pernil and pasteles. It’s not Christmas without this trinity. If there is anything, we Puerto Ricans know it’s rice. Growing up, I think I ate it with almost every meal. It wasn’t always the same rice; sometimes it was white, yellow or orange. Sometimes it had chicken, beef, pork or sausage. Sometimes it had beans over it and an over-medium egg with some fried sweet plantains on the side. Mmmmmm, I am making myself hungry again. In PR, there are countless ways to make rice but, this is my favorite hands down. 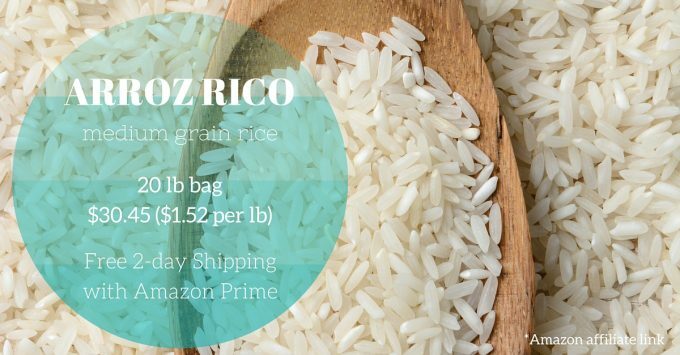 There are a few things that are essential to making a great pot of arroz con gandules. When I was a kid watching my mother make dinner, she would always rinse the rice. When I got older, I thought that this step was more of a learned habit than a necessary step. But, I quickly realized that this is a very necessary step. Rice straight out of the bag is coated in excess starch, and that added starch will make your rice sticky if not rinsed. Arroz con gandules is not meant to be sticky; it should be light and fluffy. Pork is frequently used in one form or another in Puerto Rican cuisine. It can make an appearance as a main dish or as a flavor booster. In, arroz con gandules, it’s used as a flavor booster. Can you make arroz con gandules without bacon drippings? Yes, you can use olive oil or canola oil instead. But, bacon dripping adds to an authentic flavor. However, be careful to use bacon that has not been cured so, no hickory or applewood smoked bacon. If you can find strips of skin-on pork belly like pictured above that is GREAT! If not, you can also use salt pork. But, make sure you thoroughly rinse the salt pork under cold water to remove some of the salt. Finally, take your time and cook the bacon slowly at a medium temperature. This will produce the crispiest bacon and most drippings. Sofrito is the heart and soul of Puerto Rican cuisine. It’s our version of mire pox or the holy trinity, except there are way more than just three ingredients. It is the base of many Puerto Rican dishes and leaving it out when it’s called for is not an option. I am a firm believer that homemade is superior to store bought, so I choose to make my own. But, that does not mean I never use store bought. What Kind of Rice for Arroz con Gandules? Also, if you want the coveted “pegao”, which is the crusty toasted rice at the bottom of the pot, you have to make the rice in a caldero. After the last stir of the rice while toasting and before adding the liquid add a little more oil and let the rice toast until it starts to stick to the bottom. Then add the liquid and cook as instructed cooking for 10 minutes longer allowing the rice to get crispy on the bottom. Keep an eye on it! You want it to toast not burn. Making pegao is an art not everyone gets it right for the first time. How much water for Arroz con Gandules? The standard ratio of rice to water is 1 to 2. So, for every 1 cup of rice you use two cups of water. But, when it comes to arroz con gandules I have found that that ratio isn’t quite right. The issue is that the added ingredients such as tomato sauce, sofrito and gandules and rinsing of rice equals to added liquid. I have found the ratio of 1 1/4 cups of water per cup of rice works better. This is something that my grandmother and mother-in-law taught me, and it works for me every time. 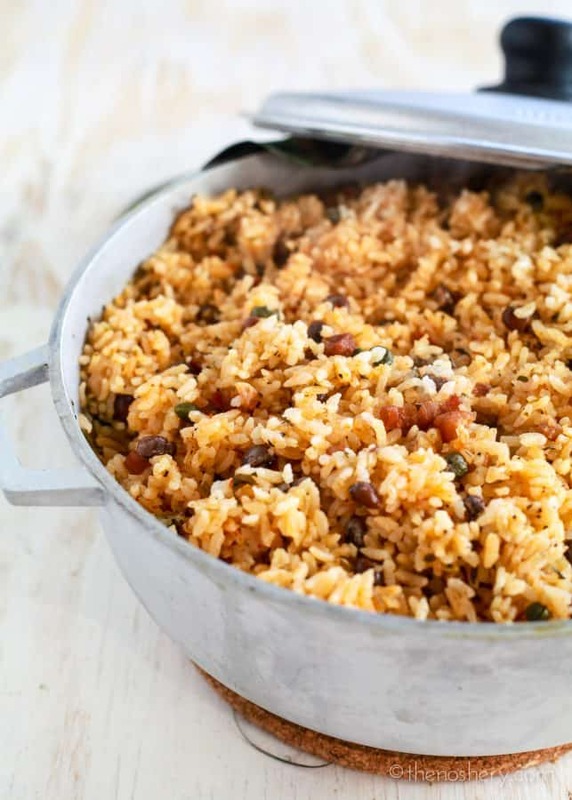 Arroz con gandules is not strictly for Christmas it’s just a must-have during Christmas! 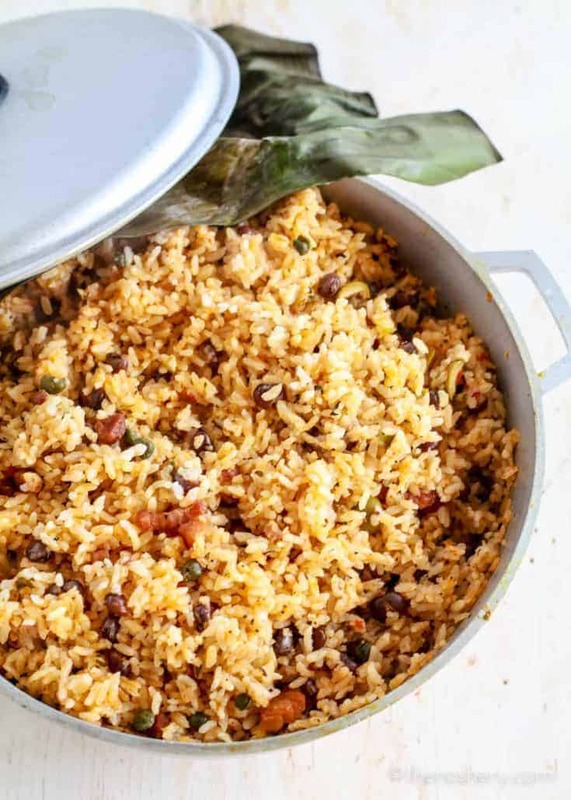 It is the most loved rice, very tender and full of flavor and I love the pigeon peas because of they kind of pop in your mouth. 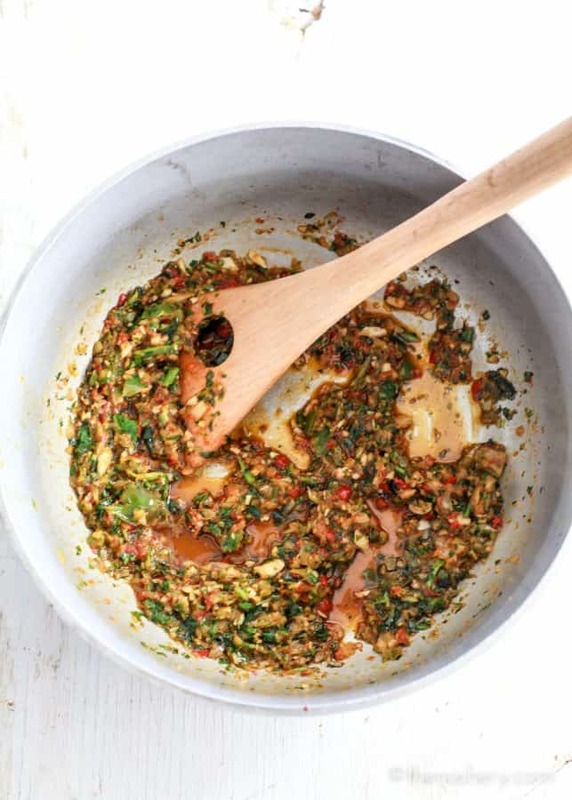 This is great and, believe it or not, it makes great leftovers. It doesn’t get hard and brittle like most leftover rice. It stays soft and re-heats very well. Make a big pot because you’re going to want more later. My favorite way to have arroz con gandules leftovers is topped with a runny egg! NOM! If you are looking for more holiday Puerto Rican treats try roasted pernil, pasteles de masa, or arroz con dulce. But you have been warned all of these are incredibly addictive. 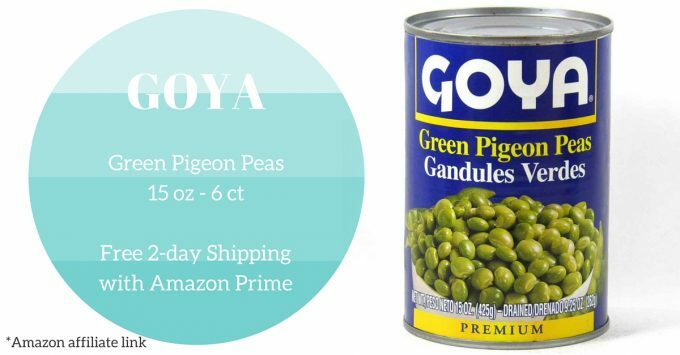 Arroz con gandules is a flavorful rice dish with pigeon peas. It's traditionally served in Puerto Rico during Christmas but, appreciated year round. 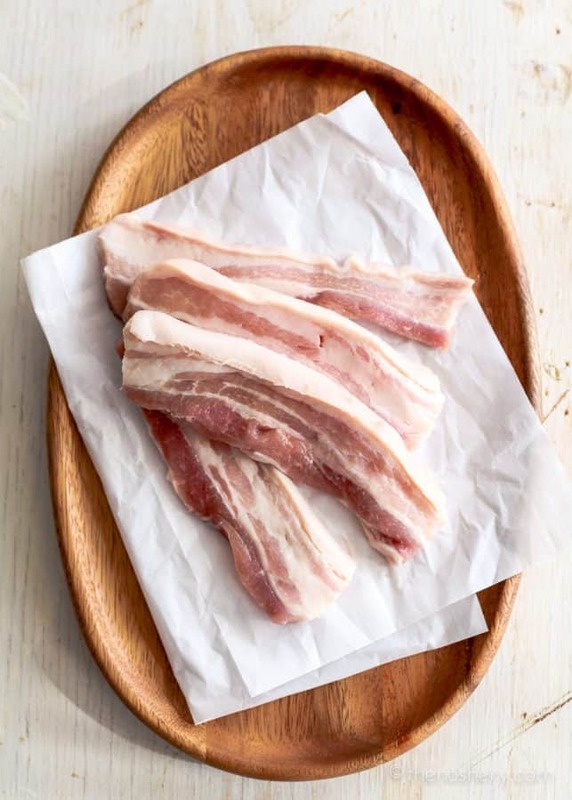 Heat a large pot or caldero on medium heat, slowly cook the pork belly until crispy, remove bacon from pot and set aside leaving the drippings. Add sofrito to the drippings, cook about 3-5 minutes. Add rice to the pot to toast the rice, about 5 minutes or until just beginning to brown. Stirring occasionally. Add tomato sauce, capers, olive and pigeon peas. Gently stir until well combined. Add water, bring it to a boil on high until water begins to evaporate, place banana leaf or foil over the rice, cover and simmer on low for 35 minutes. *It is important not to stir rice more than once otherwise, it will come out very sticky. *The banana leaf it optional, it gives the rice a nice flavor. I purchase my banana leaves at my local Asian market. Do you rinse the rice until the water is clear? This is how my Puerto Rican friend did it. She also used spareribs with the bone in to make this delicious dish. Have you ever heard of that? I do rinse the rice until it runs mostly clear. I have never used spareribs in my rice but spareribs or a ham hock is a great way to add flavor. Pork belly makes everything good! Such great flavours here! Meisedy, some day I need you to cook for me! I can not wait to make this, going to be so good! Love this dish so much! Great recipe! Finally was able to a make a perfect Puerto Rican rice. My fellow Latin friends approved with full bellies. Loved it! Thank you! Can you please clarify how to use the banana leaf or foil? Do you lay it directly on top of the rice? Or over the top of the pot, held in place by the lid? Thank you! You place it directly over the rice and secure it with the lid. Oh my goodness! You lived in Tulsa?? I lived here for almost 10 years before moving to Tampa for 5 years, now back here in Tulsa again for the past 4 years. I dated a guy from PR while I lived in Tampa and had the wonderful pleasure of getting to visit the island with him, going from his home in Bayamón, to Old San Juan, all the way to Mayagüez to his grandparents. In addition to the amazing natural beauty of the island and all loving, friendly people I spent time with, the FOOD has always been an untouchable memory. I found your site while searching for ways to recreate a little piece of Puerto Rican cooking while stuck smack in the middle of Oklahoma. THANK YOU SO MUCH for all of these delicious recipes! Maybe one day. I’ll get to visit Puerto Rico again. I swear, I left a little piece of my heart and soul there. Thank you for sharing your recipe. 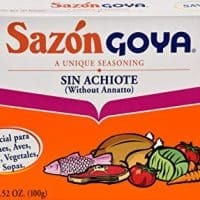 You are the first person I have found online that does not use SAZON when making arroz con gandules,etc. Your recipe is similar my grandmother’s. Abuela would have been 104 this year. You can cook without SAZONand your food comes out sabraza! Some people are sensitive to MSG! I dont use sazon either i replace it with achoite oil i makw monthly and it gold the authentic color better than sazon. Guess what I found in my neighborhood Kroger in Little Rock, AR. Medium grain rice! I’m veering from your recipe because I’ve made umpty-jillion cookies today; so I’m working with what I have in the pantry. I’ll have to get authentic and try the accurate recipe for Arroz con Gandules soon. Yum. We all adore your carnitas and posole recipes. We made it often. Actually, I have carnitas frozen awaiting the next posole craving. You are so right! Arroz con Gandules begins with bacon! Not many people are aware of that. This tip comes from a conversation my mother (God rest her soul) gave to someone she was teaching to make rice ( I was 7 years old and listening in on the tutorial): The water should be a fingertip level (2 1/2 in.) above the rice. Doesn’t matter whether it is two cups of rice or 10, perfect rice all the time. My abuela says the same thing! I made this last night for my Víspera de Reyes in NC and it is absolutely delicious. Thank you for this wonderful recipe!! *I put less water in the rice because I like my rice a bit more loose, just 3 cups instead of 4, but still, delicious. Did your family ever make this rice, but with chicken pieces? My PR in-laws make the rice with cut up pieces of chicken and then have a separate pot of beans which they ladle over top. They use wax paper instead of banana leaves. I’ve tried countless times to make this so I can continue the tradition, but my rice never turns out. Any thoughts? What do you mean by the rice does not turn out? Undercooked, sticky, wet? Thank you so much for your amazing recipes , I have always been a pretty good cook but your recipes always makes my husband and his family feel like they are back home in PR which makes me feel like i’m truly a part of his wonderful latin culture. Could this work with a long grain brown rice? I can’t wait to make this. This year I am having family and friends over for a Pre-Christmas dinner and I’ve been asked to make Arroz this year. The caveat is that my mother (Native PR) used to be the one that makes the rice but she moved to South Carolina and won’t be here this holiday. I’ve been trying to devise a way to have her ship me some cooked rice, but she’s not buying into that idea. Why not I say?!? Anyway, it’s up to me to keep the tradition. So, I hope this recipe makes me look good! P.S. I do have some of her homeade sofrito left in my freezer! That’s a plus! MMMM. Que rico! @Jari: Yes I know a lot of Puerto Ricans that use green plantains in their Arroz con Gandules. I don’t know if this is a custom from southern Puerto Rico (Salinas/Ponce area). You have to use a fine mesh grater (un guayo) and grate a green plantain until it is mushy. Season the grated plaintain with salt, adobo, or sazon, and then spoon it into the water with the rice. This gives it a great flavor, almost like pasteles. I *will* make this. I think I remember my mom adding some green plantain shreds to it. Have you tried it this way? I kind of remember it makes it mushy, but I wonder how much. I have never tried or heard of it prepared that way. 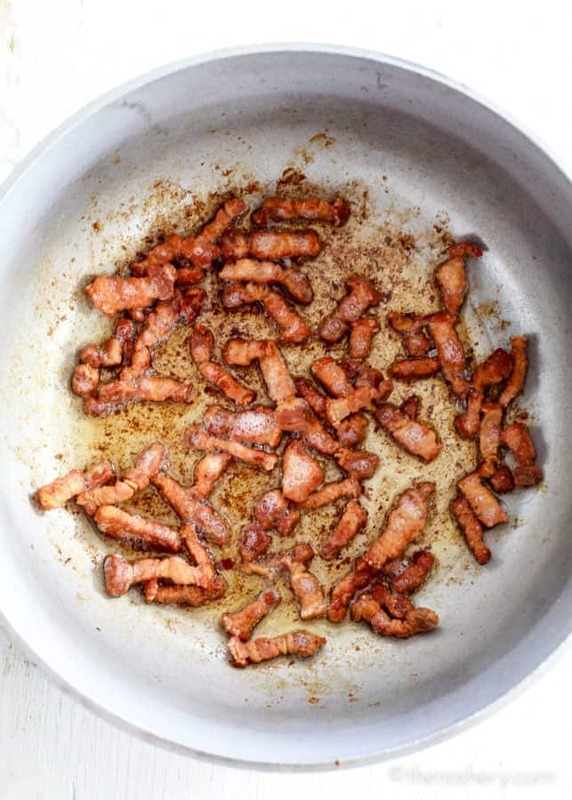 I haven’t heard of that either, but if you want to do that you can fry plantain shreds and toss them in after the rice is cooked so that it doesn’t come out mushy. Can you make this in a rice cooker? If so, would I need to make some adjustments? Time, ingredients, etc…I am known as a “rice-burner”. I have tried making this in a rice maker and it has been hit & miss, which is why I always do it stove top. Maybe it depends on the rice maker. Which one did you use, Meseidy?